Note: this site is used by our two local schools, Leavesley Aviation and YX Paragliding, for instruction. Please respect their needs. Pilots where possible should try to avoid flying close to students or low over school takeoffs and provide a very wide berth at all times to students displaying a trailing red streamer. This site is at the extreme south end of the Mynd, and should be considered as an adjunct to the main Long Mynd site. Wind direction is the same (WSW-WNW), however, it is 3-4mph stronger here and so is an option if it is too light on the Long Mynd normal take off. There are two approaches. The first is from the Long Mynd itself – walk along the ridge to the south. This path skirts the Midland Gliding Club to the south, and is a long – but flat – walk. 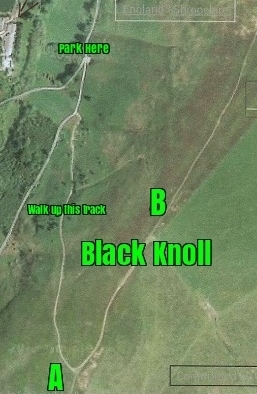 Alternatively walk up from the road at the bottom of Black Knoll, having parked in the small quarry. DO NOT DRIVE UP THE TRACK. Park right at the back close up to the hill, allowing the farmer to turn right from his track onto the road. Blocking this right turn will cause him a huge amount of trouble, so car sharing is essential. Take-off: there are two options marked A and B. Both are straightforward but keep watch for traffic coming from the right. Also be aware of pilots under instruction by the two schools. Top landing: the best option is at B. But again be aware of those under instruction. Bottom landing: this has now changed, and is the lighter field shown in the image below. 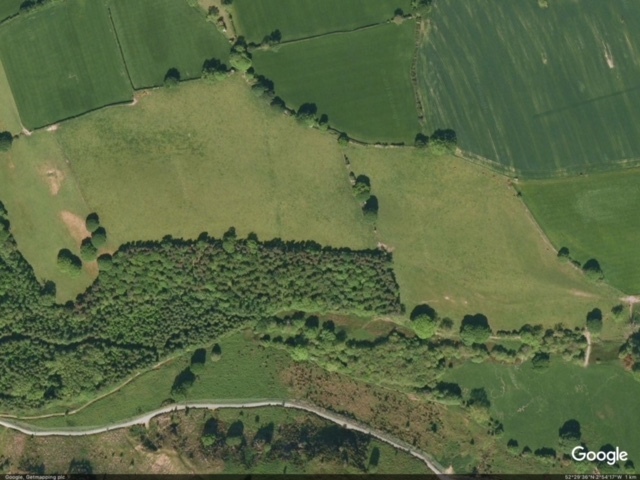 Though this looks like two fields, it is, in fact, one, with some trees in the centre. During the period from 1st September to 1st February, there is shooting on the hill and woodland below take-off. There are notices put up along the road below take-off warning of the dates and times. UNDER NO CIRCUMSTANCES should you fly during the shooting. GYMKHANAS also take place in fields below the take–offs, so be aware and do not over fly these events.